It never pays to pigeonhole Torche. They’ve been called everything from stoner metal and pop-sludge to sludge metal and doom music. Their newest release, Harmonicraft, makes any guesses off the mark. Torche purposefully defies being associated with any genre. "I think the problem with subgenres is that sometimes people don't see us for what we really are," said singer/guitarist Steve Brooks. "We're just a rock band, but we get labeled all these different things that I don't even understand; I just want to play with the bands we respect and that could be anyone. It's cool we can play with a band like Mogwai and then play with High On Fire, I like the freedom to be able to play with all types of bands and not feel out of place." Much of the labeling is partly due to the Miami-based band being best known for their second true full-length release, Meanderthal (2008). It carried all the heavy riffs and drew plenty of critical acclaim, including Album of the Year by Decibel magazine. Meanderthal laid the groundwork for a shakeup in their lineup. The success of Meanderthal didn't do as much good for the band as anyone hoped. In the years that followed, they had minimal output. They produced a handful of EPs and split releases, unless you also count Songs For Singles (2010) which was essentially recorded as a trio after the reportedly bitter departure of guitarist Juan Montoya. Songs For Singles was a solid effort despite missing some spacious guitar work. The band filled the gap by recruiting guitarist Andrew Elstner. He gave the band a shot of adrenaline. Everybody felt better about the future: Brooks, bassist Jonathan Nunez, and drummer Rick Smith. Harmonicraft adds an edge that could be Torche’s finest work to date. Put out by Volcom Entertainment, the album is bursting with thunderous riffs, perfectly timed percussion, catchy hooks, and hard rock melodies. The best of the cuts is easily Walk It Off. It includes a killer guitar solo by Elstner right off the bat. But there are others like Letting Go, which showcases Smith’s perfect percussion work. And the absolutely furious Kicking could be the band’s anthem. The clip, which was performed live at the Volcom Free Beer Party 2012, gives a hint as to how much Volcom is working to give the band ample exposure. You can also see unity among the members. 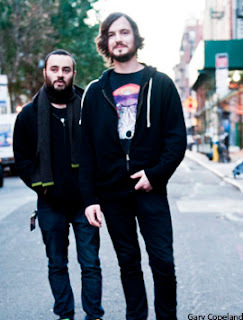 The new album was recorded and produced by Nunez in Miami and mixed by Kurt Ballou (Converge guitarist) in Salem, Mass. In other words, the work is melodic and progressive without for a second becoming predictable. This is specially obvious on the atmospheric Reverse Inverted. Even with a fan captured clip, Reverse Inverted and Skin Moth make you want to be there. What exactly is a skin moth? One might wonder. But what no one will wonder about is how their progressive sound was translated into an album cover by Santos (Eye Bleed Ink). It's kind of cool to know that Santos credits the cover art concept to an idea Brooks suggested — something inspired by the landscapes of Roger Dean for bands like Yes and Asia. It's a complete fantasy, with floating islands paying tribute to where each of the four band members are from (Miami, Gainesville, and Atlanta). And along with that, it infuses their love of all things sweet and even includes creatures breathing rainbows. "I know that every band always says that their latest album is their best disc to date, but there really is a new energy to the band and I think you can really hear that in the music," said Brooks. "We get along better than we ever have in the past; it's like a rebirth for Torche in many ways." Harmonicraft By Torche Rolls In With 5.5 On The Liquid Hip Richter Scale. While Harmonicraft easily propels the band forward in realizing its heavy yet melodic sound, there is one flaw in the production. Anyone listening more than once will hear the bass getting lost in the shuffle. That is a real shame too, because Nunez has talent. Torche is currently on tour with Corrosion Of Conformity in the United States and Canada through June and into the beginning of July. You can pick up Harmonicraft by Torche via iTunes. Check out Barnes & Noble for a better look at the cover art. You can also find Harmonicraft on Amazon. The band's touring schedule is listed on their Facebook page.